I have been arguing for the past four months on this blog and before that in my paper “The Fisher Effect Under Deflationary Expectations” (available here), that the Fisher equation which relates the nominal rate of interest to the real (inflation-adjusted) interest rate and to expected inflation conveys critical information about the future course of asset prices and the economy when the expected rate of deflation comes close to or exceeds the real rate of interest. When that happens, the expected return to holding cash is greater than the expected rate of return on real capital, inducing those holding real capital to try to liquidate their holdings in exchange for cash. The result is a crash in asset prices, such as we had in 2008 and early 2009, when expected inflation was either negative or very close to zero, and the expected return on real capital was negative. Ever since, expected inflation has been low, usually less than 2%, and the expected return on real capital has been in the neighborhood of zero or even negative. With the expected return on real capital so low, people (i.e., households and businesses) are reluctant to spend to acquire assets (either consumer durables or new plant and equipment), preferring to stay liquid while trying to reduce, or at least not add to, their indebtedness. According to this way of thinking about the economy, a recovery can occur either because holding cash becomes less attractive or because holding real assets more attractive. Holding cash becomes less attractive if expected inflation rises; holding assets becomes more attractive if the expected cash flows associated with those real assets increase (either because expected demand is rising or because the productivity of capital is rising). The attached chart plots expected inflation since January 2010 as measured by the breakeven 5-year TIPS spread on constant maturity Treasuries, and it plots the expected real return over a 5-year time horizon since January 2010 as reflected in the yield on constant maturity 5-year TIPS bonds. In the late winter and early spring of 2010, real yields were rising even as inflation expectations were stable; stock prices were also rising and there were some encouraging signs of economic expansion. But in the late spring and summer of 2010, inflation expectations began to fall from 2% to less about 1.2% even as real yields started to drop. With stock prices falling and amid fears of deflation and a renewed recession, the Fed felt compelled to adopt QE2, leading to an almost immediate increase in inflation expectations. At first, the increase in inflation expectations allowed real yields to drop, suggesting that expected yields on real assets had dropped further than implied by the narrowing TIPS spreads in the spring and summer. By late fall and winter, real yields reversed course and were rising along with inflation expectations, producing a substantial increase in stock prices. Rising optimism was reflected in a sharp increase in real yields to their highest levels in nearly a year in February of 2011. But the increase in real yields was quickly reversed by a combination of adverse supply side shocks that drove inflation expectations to their highest levels since the summer before the 2008 crash. However, after the termination of QE2, inflation expectations started sliding back towards the low levels of the summer before QE2 was adopted. The fall in inflation expectations was accompanied by an ominous fall in real yields and in stock prices. Although suggestions that weakness in the economy might cause the Fed to resume some form of monetary easing seem to have caused some recovery in inflation expectations, real yields continue to fall. With real yield on capital well into negative territory (the real yield on a constant maturity 5-year TIPS bond is now around -1%, an astonishing circumstance. With real yields that low, 2% expected inflation would almost certainly not be enough to trigger a significant increase in spending. To generate a rebound in spending sufficient to spark a recovery, 3 to 4% inflation (the average rate of inflation in the recovery following the 1981-82 recovery in the golden age of Reagan) is probably the absolute minimum required. Update: Daniel Kuehn just posted an interesting comment on this post in his blog, correctly noting the conceptual similarity (if not identity) between the Fisher effect under deflationary expectations and the Keynesian liquidity trap. I think that insight points to a solution of Keynes’s puzzling criticism of the Fisher effect in the General Theory even though he had previously endorsed Fisher’s reasoning in the Treatise on Money. 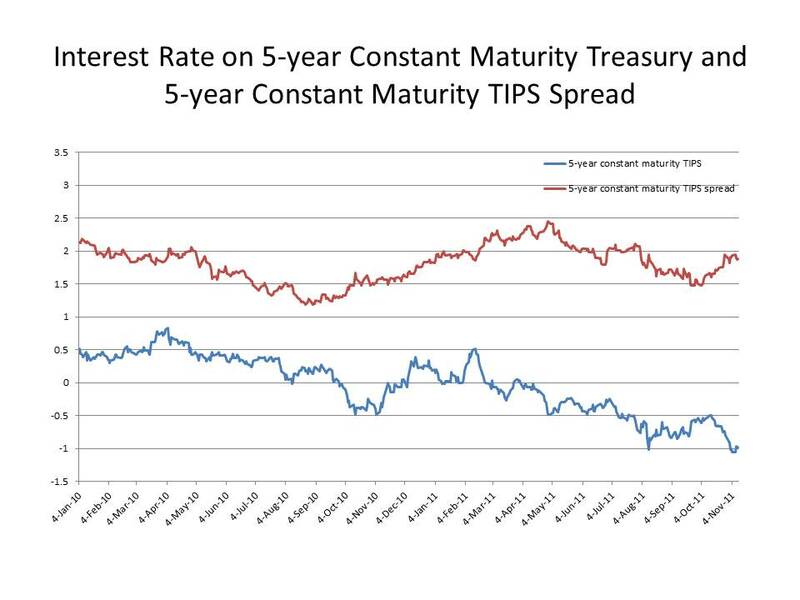 As evidence of a negative own-rate on capital, you use 5-year constant maturity treasuries. The own-rate, or q, or ratio of spot to forward prices on these securities is negative. But why should the own-rate on 5-year TIPS necessarily represent the expected return on real capital? For instance, I could say that the own-rate q on TIPS is negative only because the l-term is so high given the scarce nature of collateral. Or I could say that the c-term for TIPS is inverted because one can expect to rent TIPS out at a profit, thereby compensating for negative q. In other words, I can come up with arguments for why, despite q being negative, the total expected return on TIPS is still positive, and therefore why the expected real rate of return on capital is positive. Anyways, as you can see, the concept of the real interest rate or real return on capital is very confusing to me and any clarity would be much appreciated. Hi, I’m a big fan. Have you tried to publish your paper? You argue for s.t. real yields of around -4% (assuming you agree with ZIRP) for a couple of years. I wonder what happens in year 3? How does the Fed arrest 4%+ inflation in year 3 if real yields are still negative? Alternatively, how do they maintain a recovery when real yields must rise six percentage points to arrest inflation? Inflation has momentum, just like an ocean liner. You don’t stop the ship by reducing the speed of the propeller; you stop it by throwing the propeller in reverse. Excellent blogging. Yes, there are some things more important than containing in inflation. Generating health and robust economic growth for example. Give me five percent real growth, for five years, and I will eat five percent inflation for breakfast. J.P. You are right that the yield on TIPS is not strictly the same as the own rate on capital (or the ex ante real rate on real assets). I am assuming, however, that under “normal” conditions, they are reasonably closely correlated. But there is some hand waving taking place, which is one of the issues that I am still trying to resolve in my own mind. What do you mean by renting out TIPS? Simon, Thanks, I should have an email address on the blog, but I haven’t yet figured out how to get it posted on the blog. Before I send the paper to a journal, I want to update the regressions with observations from 2011. I would also like to improve the discussion of the breakeven TIPS spread and exactly what it means. David, My view is that rising prices, by increasing spending by both households and businesses, will improve profit expectations causing a virtuous cycle of increasing output and employment, will rapidly raise the real interest rate. I think this started to happen in the late fall and early winter of 2010-11, and I would expect real interest rates to revive if the Fed made its policy goals explicit and credibly committed to following through. I agree that there is a certain inertia associated with inflation, which is why the Fed should establish a target price level, not just a target inflation rate. Under the gold standard the price level was stable over time, but there were pretty sizable yearly fluctuations (positive and negative of course) in yearly inflation. Benjamin, As I just said to David, I would prefer a price-level target to an inflation target. I think that it would be better to get the inflation over with in a hurry and then go back to price stability than to stretch out the inflation over a number of years so that people get accustomed to it. David, you can rent your securities out to investors, usually short sellers. But if TIPS aren’t this ideal asset, then what is? And if there is no such asset, it seems problematic to have conversations that include a variable that can’t exist. David, An elementary puzzelment ? Is there is or is there ain’t a contradiction here ? What makes that particular Krugman post “bizarre”? He’s been patiently repeating his arguments for years, watching people dismiss him for being “shrill” and/or “outside the mainstream”… why wouldn’t he be grouchy at this point? Or a recovery can occur because the after tax cost of debt service reaches a point where once unprofitable ventures become profitable – and on an after tax basis, the cost of debt service in the private sector can indeed be negative. You have got to understand what Abba Lerner was talking about when he said that “Financing government expenditures should not be thought of in the same way as private finance”. The reason is this – the federal government can pay any interest rate (real or nominal) simply because it has a dedicated revenue stream (taxes) and the taxes to pay the interest on the debt can come from any time period out to infinity. Meaning the federal government has an infinite revenue stream matched with an infinite financing horizon. The federal government could literally sell 100 year or 500 year bonds. If you look to the capital markets, you will notice that corporations sell senior claims on their revenue streams (bonds) and junior claims (equities). The federal government could easily do the same thing. For instance, suppose the U. S. Treasury department sold a tax receipt that appreciates at 10% annually over 30 year, BUT the holder of that liability must realize the gains in value against his own tax burden in year 30. Borrowing at 5% over 30 years and using the receipt as collateral, the after tax cost of debt service is severely negative. Reading through this (very informative), it’s occurred to me that the process you describe isn’t exactly how people “out there” in the economy “actually think.” The point is not that I’m going to trash “unrealistic economic models of human behavior” but more like that though the processes you describe are the fundamental ones, in my view, the behavior that people engage in is in response to factors that are themselves caused by the processes you describe above. JP, That’s the repo market, right? TIPS are actually more like an option, because holders are compensated for inflation but not penalized for deflation, so when the expected rate of inflation tends toward zero, the expected return on the option is high overstating the implicit real interest rate. To correspond to the real rate on capital, the TIPS would have to be restructured to make the inflation adjustment symmetric. The argument about which assets correspond to the natural rate of interest is a theoretical one that applies in intertemporal equilibrium. I’m not saying that operationally you can actually find an asset calculate its own rate and deduce the implicit real rate. But perhaps it would be worth trying to do that. Wanna give it a try? Joe B, Maybe there is, but I don’t see it. Joseph, I think that Kevin meant that Krugman was picking on the wrong guy (namely, moi). But I don’t mind; I am flattered that Krugman noticed me. Frank, I am not sure how your comment relates to anything that I wrote. Andrew, Thanks for your comment, which is how I would describe what I am doing. I hope that we are right. We are both talking about the cost of debt service (interest rates). In the private sector (mortgages, student loans, etc.) the after tax cost of servicing the debt is lower than the pre-tax cost because the interest payments are deducted from taxable income. And so, while you may be paying 5-6% on a mortgage pretax, your after tax interest payments may be something like 4 to 4.5%. You are saying we need higher inflation to lower the real cost of debt service. I am saying the federal government could sell tax breaks with a rate of appreciation and a duration to lower the after tax cost of debt service in the private sector. For instance, if you buy a 30 year tax break appreciating at 10% annually and you have an equal amount of 30 year debt that you are paying 5% on, your after tax cost of debt service is negative. This essentially escapes the 0% lower bound – what Paul Krugman keeps harping on. 0% is not the lower bound on an after tax basis. What people like Mr. Krugman fail to grasp is the fundamental difference between public finance (federal government) and private finance. In the private sector people and companies can and do go bankrupt. The federal government literally cannot go bankrupt because its financing horizon is infinite and its revenue stream (taxes) is infinite as well. The federal government is not like a company hocking a hot new product that goes bust (hoola hoops) or selling a product that gets outmoded (typewriters). Governments can’t go bankrupt? Someone should have told Berlusconi and Papandreou! Hi David, yes, that’s the bond repo market. With stocks it’s the stock lending market. I can understand how in an intertemporal equilibrium model a theorist can determine the expected economy-wide required rate of return by adding theoretical storage costs and the theoretical liquidity premium to the theoretical own-rate of a particular asset. Since the returns on all assets equilibrate, the return on that one asset will equal the return on all assets. But operationally, I don’t know how we can ever calculate it since we don’t have enough data. Own-rates are sometimes observable, and storage costs too, but who knows what liquidity premiums actually are. It seems to me that the economy-wide real rate will always be unobservable. Maybe they should have. Governments can’t go bankrupt (fact) but that is not a reason for governments to borrow money willy-nilly. There are two sides here – stated facts (governments can’t go bankrupt) and good policy (governments should refrain from borrowing money willy nilly). The policy side is one of productivity. Productivity is equal to real gross domestic product / total debt outstanding. Because a sovereign government on its own produces nothing, any increase in government borrowing will more than likely reduce the productivity of the nation that the government oversees. Which is not to say that everything that a government does is bad. Insurance (Social Security, Medicare, etc.) and defense of country are important roles for a government to fill. The problem comes in when those items are used to stoke economic output (Militant Keynesism for instance as Mr. Krugman would call it). Why bizarre? It looks like Glasner is agreeing with him (finally) and he’s taking the opportunity to enjoy the fact. Frank, OK, I get your point now. Off the top of my head, it seems like a worthwhile idea to re-introduce (and perhaps raise) a temporary deduction on interest payments and perhaps (temporarily) increase it for businesses. Whether governments can go bankrupt seems to me like one of those metaphysical questions that have no clear and unambiguous answer, which is not to say, that such questions are not worth discussing, but one should be aware that one is engaging in a metaphysical discussion. JP, You are right, it’s hard. But someone just might make a really valuable contribution by making the effort. You are missing the point here (as do most economists). You look at government as an arbitrator between entrepeneurs (businesses) and workers (labor). And you are making a bad assumption that deficits matter – hence you try to balance a decrease in the tax burden on the individual and an increase in the tax burden on the entrepeneur. It is called a Marxist view of the role of government. The reason I substitute Debt (D) for Money (M) is that all money begins life as a loan (debt). Also, now you understand why increasing inflation is a bad idea. It decreases productivity. 2. Temporary economic changes (tax breaks, spending programs, etc.) get no economic traction because producers don’t produce more based on temporary changes in cost and consumers don’t consume more based on temporary changes in income. Read Milton Friedman – permanent income hypothesis. Consumers base their spending decisions not on their current income, but on their anticipated future income. The same can be said for producers. Producers base their investment decisions not their current costs, but on their anticipated future costs. This is not metaphysical or mystical or anything of the sort. It is just one of the few facts in economics. The simplest description of bankruptcy is this – the value of an entity’s liabilities exceeds the value of an entities assets. Simply put, it is a balance sheet / cash flow problem. For the private sector, this can happen because – a product goes defunct, a person goes unemployed, or a hundred other reasons. The federal government in truth has no assets. All that has is liabilities. Currency and bonds are both liabilities of the federal government. And so to say that the when the value of the governments liabilities exceeds the value of its assets, the government will go bankrupt is an oxymoron. You might say that the federal government owns land and buildings, and thus has assets, but the point you are missing is that the federal government’s liabilities are not claims on its property holdings. Holding a U. S. Treasury bond does not give you a property claim on the Washington Monument. Frank, I don’t think that deficits always matter, but sometimes they do. I am not particularly concerned about the current deficits, but I don’t discount the possibility that a high ratio of debt to GDP could be a problem. So I am a bit of an agnostic on the importance of deficits. The Modigliani-Miller theorem says that the choice between debt and equity has no effect on the value of a corporation. Are you making an analogous argument about the government budget? I don’t get what Marxism has to do with it. What, in your model, determines the optimal deficit at any time? Bank money is a debt; it obligates the bank to redeem its money in terms of an asset it cannot create. I don’t understand how fiat money is a debt, how is a government obligated to redeem it in terms of any other asset? Whether temporary changes have any effect depends on the definition of temporary. The marginal propensity to consume out of a temporary increase in income is not zero, and households that have run out of liquid assets and can’t borrow have a high MPC even out of temporary income. Governments can subject themselves or be subjected to rules that make them more similar to private entities than your somewhat absolutist description would suggest. Okay, first distinguish between deficit (the difference between current revenues and current expenditures) and debt (one way a deficit can be financed). Deficits can be financed without ever issuing debt. Corporations do it all the time – it is called selling equities. 3. Debt is a claim on cash flow / liquidation value. Equity is a claim on profitability. A company can have positive cash flow, a high liquidation value, and never earn a cent of profit. And so from an equity holder’s perspective, the value of the company is low. From a bondholder’s perspective the value of the company can be quite high. Basic corporate capital structure places debt at the top, subordinated debt / convertibles second, and the various classes of equity (class A, class B, etc.) third. This capital structure exists to define modern bankruptcy laws. When something is overproduced, this tends to depress prices. When debt is used to finance this production, the real cost of servicing the debt rises as prices fall. This is in a nut shell the Great Depression – poverty in the midst of plenty and debt deflation, something that Fisher understood well, but did not have a solution for. The problem with Marx’s whole line of thinking is that it assumes that all productivity gains must go to the entrepeneur, and that the cost of debt service is lower bound at 0%. There is not an optimal deficit per se. There is an interest rate on an after tax basis that can be reached to restore full employment. That interest rate is realized by having the federal government run a budget deficit and selling tax breaks to finance that deficit. What I am basically saying is that the money that is spent by the government will always have a lower future value than the asset it uses to finance the deficit. And so when running a deficit, the federal government should seek to increase the value of its liabilities. The federal government’s liabilities become private sector assets via double entry bookkeeping. Frank, What is the government analogue to issuing corporate equity? Just because debtors have a prior claim on assets does not mean that equity holders have no claim on a company’s assets. Otherwise, why would the stock of companies that pay no dividends have positive value? I am sorry, but I am not really getting most of what you are saying about Marx, debt, interest rates or the Great Depression. Maybe you can point me to some reference where I can start from square one? A government bond is a claim on future tax revenue. This means that interest payments made on a thirty year bond issued today are taken from tax revenue collected thirty years from now. Courtesy of the 14th amendment, a government bond is a senior claim on that tax revenue. This means that repayment on government bonds supercedes all other government expenditures. The analogue to issuing corporate equity, is for the federal government to sell a tax break with a duration (5 years, 10 years, 30 years) and a rate of appreciation (5%, 10%, 15%, etc.). Let us call this tax break a forward year tax receipt (FYTR). It is a paper (or electronic) receipt for taxes paid today that are due some time in the future. A FYTR like a government bond has a rate of appreciation and a duration. Unlike a government bond, the return on investment is not guaranteed. If you buy a federal government bond, you are guaranteed by the 14th amendment to receive your money plus interest back. If you buy a FYTR, you must have a tax liability equal to or greater than the future value of the FYTR to realized the gains. As an example, imagine yourself buying a $10,000 30 year FYTR with a 7% rate of appreciation. At the end of 30 years your FYTR would be worth $76,123.00. The only way for you to realize the full value of the FYTR is to have a tax liability of at least that much 30 years from now. Compare this with buying a 30 year bond that pays 7%. In that case, 30 years from now you receive $76,123.00 with no strings attached. This is a plot of the consumer price index from 1927 to 1933. Starting in about mid 1930, prices collapsed and kept falling for about 4 straight years at about a 10% per year clip. When that happens, monetary policy is impotent (despite to protests of Milton Friedman & Ben Bernanke). If you are a borrower paying 2% on a 10 year loan and your wages or the prices you are getting for your products are falling 10% annually, your real cost of debt service is 12%. And so what happens if the federal government sells you a 10 year tax break that appreciates at 12% annually? If that happens, then your real after tax cost of debt service is close to zero. Equities (stock) get their value from present and future anticipated profits. A company can have losses for several quarters (years?) and still maintain a positive equity valuation because stock holders believe that the company has a profitable future. Also, recognize that dividends are not contractual claims. Instead they are discretionary claims. A company is under no legal obligation to pay a dividend, and so a company can initiate, suspend, or eliminate the payment of dividends at any time without legal repercussions. Stocks and bonds are legal contractual claims of ownership of a company. Stock holders maintain the legal right to hire and fire leadership positions within the company. Bond holders maintain legal claim over the liquidation value of the company.